Small Dog Circus 1. This class is for dogs 25 pounds and under and follows the structure of our Circus 1 class tailored specifically for small dogs. You and your dog will learn basic obedience as well as tricks. We focus on setting a strong foundation so that your dog can excel at advanced work. $260 for 6-week class series. Private Lessons: 1 hour private lessons. Sign up here. Circus I: This class is for dogs of all ages(including puppies), shapes and sizes. Here, you and your dog learn basic obedience, basic tricks and routines. Small classes allow us to offer individualized instruction. We focus on setting a strong foundation so that your dog can excel at advanced work. $260 for 6-week class series. 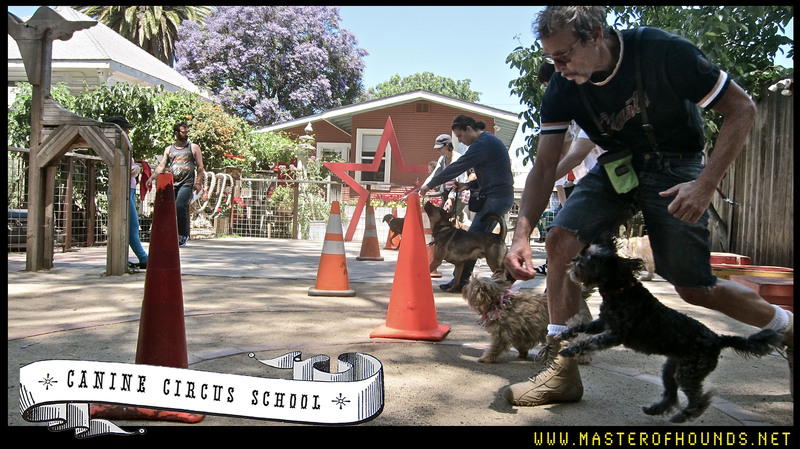 Circus 2 is for students who have completed Circus 1 and their dogs show a complete grasp of the Symmetrical Foundation. A 1 minute stay, 20-foot Send to a pedestal, 10-foot Send Around Cone, Sit Pretty, Bow, spin. More importantly, Circus 2 dogs show an ability to work away from the handler in a distracting situations. Level 2 dogs practice syncopated group drills at a faster speed and with more precision. Our trick repertoire is expanded and handlers are expected to start cueing the dog from a distance. Circus 3: This is our advanced trick class, except we take it a step further and include stunts and gags. Circus 3 will teach you to get creative with your dog’s training. More advanced students work on agility, stunts, synchronized behaviors with other dogs,and useful service dog behaviors. Get your creative juices flowing while conditioning physically and building confidence. $260 for new students to Circus II/ $195 for continuing students. 6-week session. Prerequisites: Circus 1 & 2; or if you have trained privately with Francis. Circus 4: In this class we work on building up your schtick. Circus 4 focuses on advanced object manipulation and service dog skills as well as performance and improv drills. Teaching you to put your audience into a state of awe with just your dog and few props. Pre requisites: Circus 1-3 , Shaped Retrieve competency. This class relies on the dogs understanding of the Shaped Retrieve exercise learned in Circus 3. If you do not have a good grasp of the Shaped Retrieve please continue in Circus 3 until you have. Light switch: easily score this service dog classic by recombining already learned behaviors. Continued perfection of other routines learned in prior classes and how to build new ones. I am very interested in Oakland classes for my Bichon Frise. I would like to know how much they cost, where and when they are, etc. She knows several tricks and has passed her CGC. I would like to expand her repertoire so that she has more to do when she performs for schools, senior centers, etc. Her main problem at the moment is being too easily distracted by other dogs or noisy kids. She does well with a quiet attentive audience, but that is not always what we get. I would like to know what you have to offer.